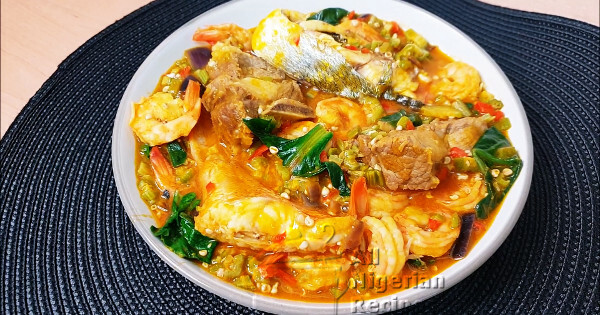 Seafood Okra Soup gives you the chance to add all the possible seafoods: fish, shrimps, prawns, crabs, lobster etc to your Nigerian soup for swallows. This delicious Okra Soup is great everyone including those on a keto diet. Just serve it with low carb fufu meals. The following are what I used to prepare a medium pot of Seafood Okra Soup. Feel free to add your favourite seafoods as listed above. I used 1 gilt head sea bream fish and 1 red sea bream fish. Other fish you can use are mackerel, croaker fish, catfish or tilapia. The sweet pepper is fresh paprika and it serves to add some appetizing colour to the soup. You can skip it if you wish. Or replace with Nigerian tatashe peppers. I do not add crayfish to Seafood Okra Soup because everything needs to be fresh. The shrimps (or prawns if you add them) are technically fresh versions of crayfish. Clean the fish, some fish mongers can do this for you in the market. Then cut them into sizeable pieces, see video below. Shell and de-vein the shrimps. See the video below. Hand cut or grate the okra. Click here for how to do that. Chop the peppers. I prefer chopping so they are still visible in the soup. You can blend or pound them in the mortar. Chop the spinach. These days, I prefer tearing them up with my fingers. If they are small baby spinach, I add them like that. Cook the beef with the stock cubes and half of the diced onions. When done, remove the beef and add the fish. Cook for 5 minutes, at most 7 minutes so it does not disintegrate then gently take them out. Add the shrimps and cook for 5 minutes and take them out. In a different pot, add the red palm oil, once it heats up, add the remaining onions, fry for a bit. Add the okra and fry till it heats up all over. Start adding the stock bit by bit and stir very well to activate the elasticity of the okra. Note: If you want less water in your own soup, boil down the stock by a lot before adding it to the pot of soup. When all the stock have been added, add the peppers and the spinach. Cover and cook for 1 minute maximum. Add the fish and shrimps, add salt of necessary and stir very well. The Seafood Okra Soup is ready to be served with any Nigerian Fufu Meal including low carb fufu meals. Click here for all Nigerian fufu recipes.